Reading music is nothing for bass guitarists to be afraid of. You don’t even have to read music to be a good (or great) bass player, but it certainly enriches your musical experience and opens doors that otherwise may remain shut. When you solve the mystery of reading music and discover the joy in it, you may find yourself reading Bach preludes instead of a novel before going to sleep. Chords can evoke certain moods. For example, a major chord usually sounds happy and bright, whereas a minor chord sounds sad and dark. Just as a color on canvas may evoke a certain feeling, a chord works on the same principle, only acoustically instead of visually. The chord chart, which is one form of musical notation, tells you in chord symbols what notes you can choose for playing a particular song and how many beats each chord lasts. Chord symbols name the root of a chord, such as E, and the color of that chord, such as m for minor or Maj for major. A chord chart doesn’t tell you exactly which notes to play. The style of the music and your (or your bandleader’s) taste influence the sequence and rhythm of the notes you choose from the chord. Part of the fun of playing is choosing your own notes and developing your own creative style. Just keep an open mind…and open ears. If it sounds good to you, it usually is. Another form of notation spells out both the rhythm and the notes; it’s known as music notation. Regular music notation is written on a musical staff. The musical staff consists of five lines and four spaces on which the notes are written. The clef (the first symbol you see at the beginning of the musical staff) shows whether the notes on the staff are low (bass) or high (treble). For bass players, the bass clef is the clef of choice. Music notation is much more exact than the chord chart. Not only does it tell you what note to play, but it also tells you which octave to play the note in, how long to hold the note, which note to accent, and so on. In short, this method doesn’t leave much room for creativity, but it does leave the embellishments up to you. You can hear exactly what this sounds like when you listen to Track 8. Every note is accounted for. The bass sounds one octave lower than the written note. Piano players, when reading from the same sheet as the bass player, play the same notes an octave higher. Tablature (or tab) shows you which strings to press and on which frets for the correct notes. 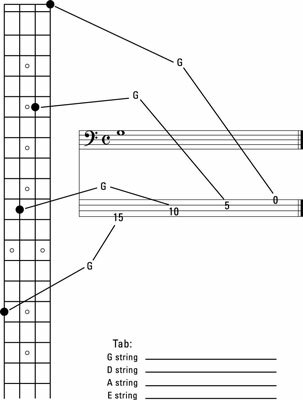 Using this method, you can see the exact notes and their sequence, but you generally can’t see the rhythm, which is why tablature usually is accompanied by music notation. The best choice of note to play is determined by the position of the other notes in the pattern you’re playing. Keep in mind that you want to avoid any unnecessary shifts in your left hand; whenever possible, play the notes of the chord in one area of the bass neck. The vocal chart is a common form of notation (combining the lyrics of a song with its chords) that you use when you’re working with a singer or songwriter. With this type of notation, you’re getting only the most basic information for your accompaniment, which means that you’re free to explore different ways of interpreting a song. In a vocal chart, the chord is simply written over the word that’s sung when the chord is played. Vocal charts are an imprecise notation technique, but if you’re familiar with the song, sometimes that’s all you need. Just make sure all your bandmates are familiar with the same version of the song you’re playing. And remember, in this particular case…follow the singer!